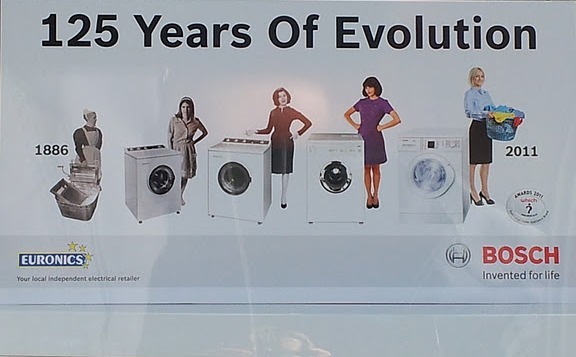 Bo Novak snapped this photograph of a Bosch ad in a storefront in Bath, U.K. “125 years of evolution,” but apparently men still haven’t figured out how to use the washing machine. See also Laundry: Women Have Always Done It. At our Pinterest page, you can browse all of our examples of gendered housework and childcare. On the evolutionary aspects of laundry: I'm glad to see that Satoshi Kanazawa is still finding an outlet for his scholarly work, but it needs more racism. (I mean the 1886 woman only comes up to the 2011 woman's waist!). not only that, but I dress up in heals and a skirt when doing laundry. And apparently women still wear dresses or skirts to do laundry. Oh no! Someone beat me to the same snarky comment! Or children. Or nonwhites. Or. Or. Or. What about the fact that this ad campaign is ridiculous in the first place? On a less than intellectual note, not a very smart decision to have an ad praising the development of washing machines when all the machines in the lineup look identical. Wait a minute, women do laundry? What fantasy world is this? And how do I get there? I'd prefer to do laundry the 1886 way -- that's obviously a maid, and I'd choose that over having to do it myself, no matter how modern the machine, thanks. It's also interesting that the images get taller as they get more modern. Another example of the taller = better height bias. I do my own laundry because I haven't found a woman who can do my laundry the way I want. I'm not sure of the point. What does the 2011 model (the machine, not the human) do that the earlier models don't? (Except the hand wringer on the left). I am waiting for a machine that can find stray socks, and can also sort, fold, and put away each load. Otherwise, these machines all just swish and rinse. Forget the laundry, look how much taller women have evolved over the past 125 years. So it took 125 years for women to learn to use a laundry basket? Like others here, I'm amazed how little the design of washing machines have changed over the past hundred years, as well as the construction of white domestic femininity. I am also amazed at the fact that in 1980, my grandmother was still using a washing machine design manufactured almost a hundred years earlier. I love the line in the Clorox commerical "your grandmother did laundry...you mother did laundry...and also a few men..." almost had me doing a spit-take. These creative folks need a copy editor! I saw a Tide commercial yesterday with a man in it (a father at home with a young girl). I like how the modern woman is in "career woman" clothes. Now you can do all the housework AND work full time! Actually, the person in the 2011 picture is a man. It's a pity that you are too narrow minded to see that.